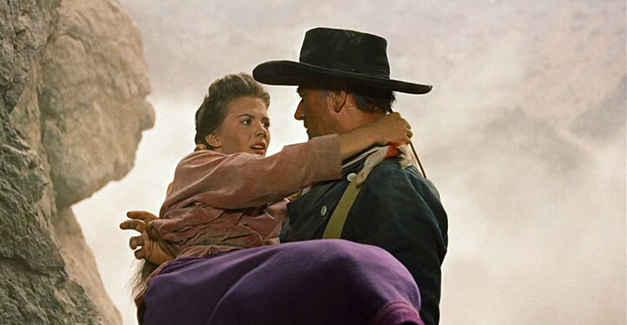 This John Ford directed film released in 1956 is a visually captivating movie shot in Utah, but its focus is on family, in all its forms, and how it can be a positive and a negative force. 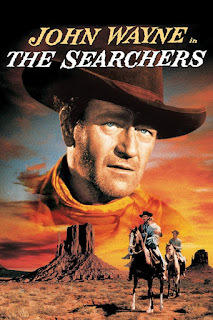 If you want to study a film to do an impression of John Wayne, with his halting, growling delivery, this is a good movie to study. At times he almost sounds like a parody of himself. But his Ethan Edwards is an interesting character. He returns to the home of his brother, Aaron (Walter Coy), following his hitch as a Confederate soldier in the Civil War. But, it has been three years since the end of the war. Where has he been and what has he been up to? He provides no answers, but he has new Union gold coins, so his brother questions if he was involved in illegal activity. It is obvious that Ethan and Aaron’s wife, Martha (Dorothy Jordan) have romantic feelings for each other. Perhaps that is why he took so long to return to his brother’s farm. Family ties can become strained when emotions may lead to rancor. Ethan’s affection for his nephew and nieces is obvious. But, he shows contempt for an adopted young man, Martin Pawley (Jeffrey Hunter). He says he is part Cherokee. His last name begins with the word “paw” which implies something animal-like, and, probably, in Ethan’s mind, savage. At one point he calls Martin a “blanket head,” a slur referring to his Cherokee background. The derogatory remark resembles the current negative phrase, “towel head,” aimed at those of the Islamic faith. Ethan actually saved Martin when the latter was an abandoned child. Now, Ethan sees him as an outsider who has invaded his family. It shows the two sides of Ethan – one, a savior of an innocent, and the other a bigot, who cannot tolerate someone who is different from himself or his family. In a way, he is like America, which welcomes diverse peoples (the neighboring Jorgensens are indicative of these), but also, sometimes, harbors a xenophobic tendency. Ethan also found a family in the army in which he fought. When he returns to his brother’s place, he is still in uniform. When the Reverend Clayton (Ward Bond) notes that Ethan was not seen at the surrender to the North, Ethan says, “I don’t believe in surrender. Nope, I still got my saber, Reverend. Didn’t beat it into no plowshare, neither.” He earlier handed the saber to his nephew, Ben (Robert Lyden). Perhaps this shows that along with love, violence is handed down through a family’s generations. He has not moved on. He remains emotionally attached to his brotherhood of soldiers, and is still at war. He needs to find another enemy to fight. 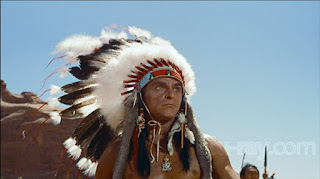 An Indian warrior named Scar (Henry Brandon) becomes that enemy. It appears that Native Americans have run off with cattle belonging to Lars Jorgensen (John Qualen). 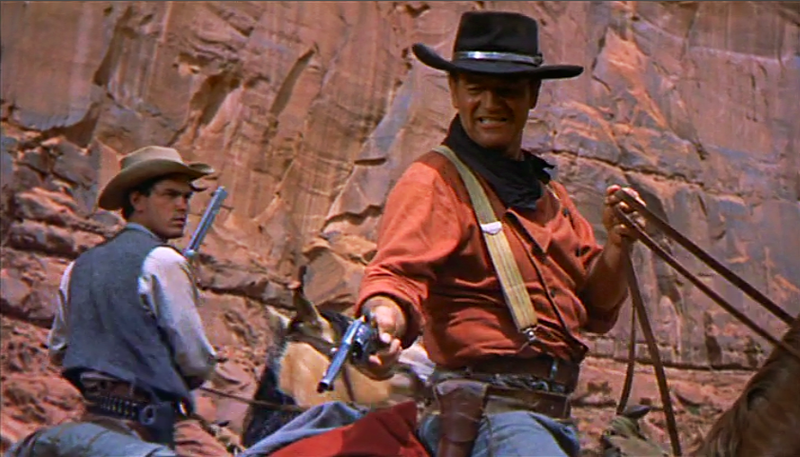 Clayton, who is also a Captain in the Texas Rangers, deputizes Ethan and Martin to chase down the thieves. Ethan, Martin, and Mose Harper (Hank Worden), go with Clayton, but Aaron stays with the family at the farm. The search party sees that the cattle were taken and slaughtered by some Comanche to lure them away from the Edwards ranch. We then see the Comanche chief, Scar, blow a horn, signaling an attack. When Ethan and his party return to the farm, they find the house burning, and Aaron, Martha, and their young son, Ben are dead. Daughters Debbie (Natalie Wood) and Lucy (Pippa Scott) are missing. As they bury the dead, Ethan yells at the minister because the ceremony is too long. He is now on the warpath, ready to seek revenge for the loss of his family. 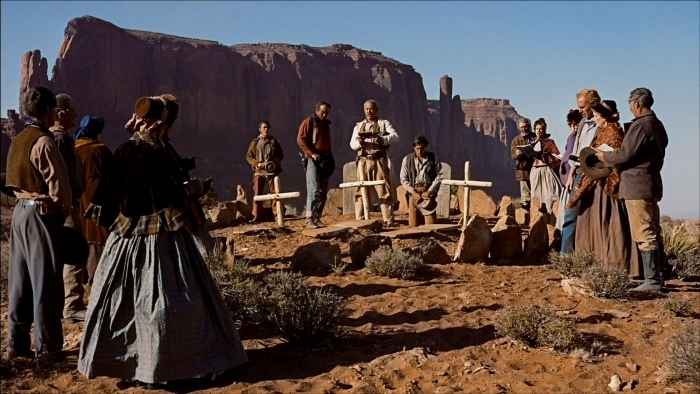 On the way, they find a dead Native American, who was killed probably in the confrontation with Aaron. Ethan mutilates the body, shooting its eyes out. He does this because the Comanche believe that one cannot enter the spirit-land without sight. His spirit will be forced to “wander forever between the winds.” Ethan’s anger and bigotry have so poisoned him that he defiles not only his own people’s religious practices at the funeral, but also those of others in his desire to torment his prey beyond the grave. Also, Ford is showing us that the culture of white people and that of the Native Americans are similar in combining war and religion. The Native Americans cloak their victims of combat in religious belief, and the whites are initially led by Clayton, who is an ex-soldier and now a lawman, but also a minister. 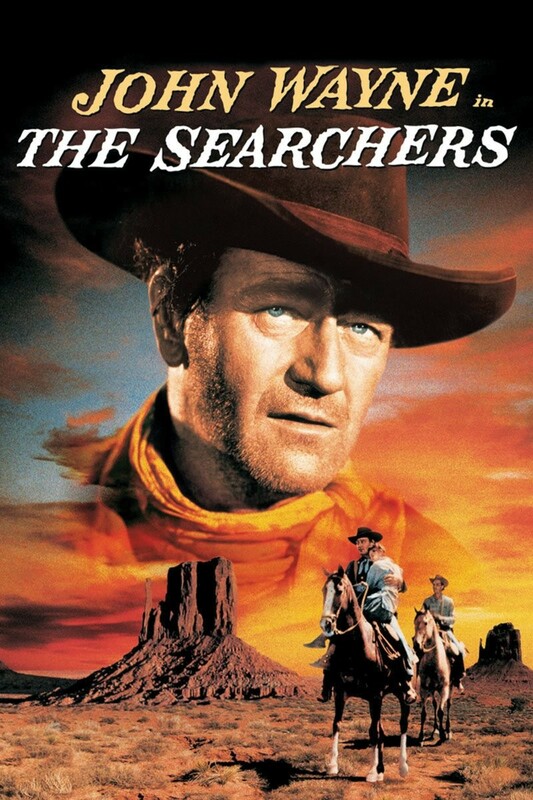 The search party encounters the Native Americans, and in a shootout, one of the whites is injured. 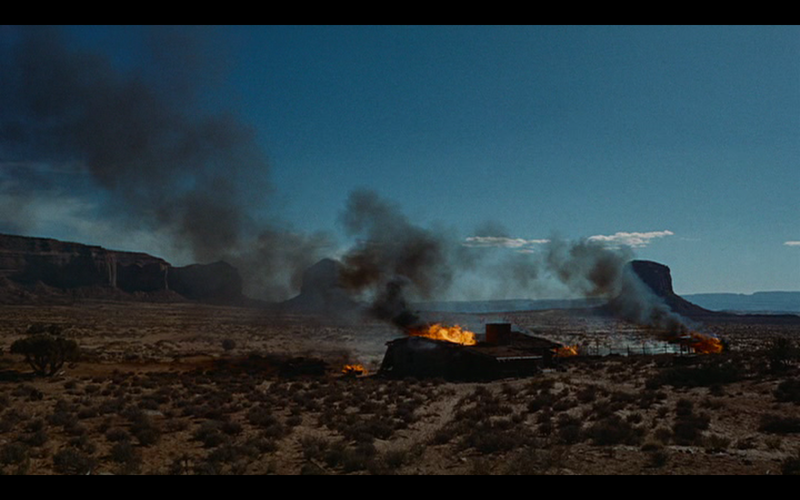 Etahn will not even allow the Comanche to gather their dead and wounded, as he continues to shoot at them. Clayton chastises Ethan for his lack of decency. 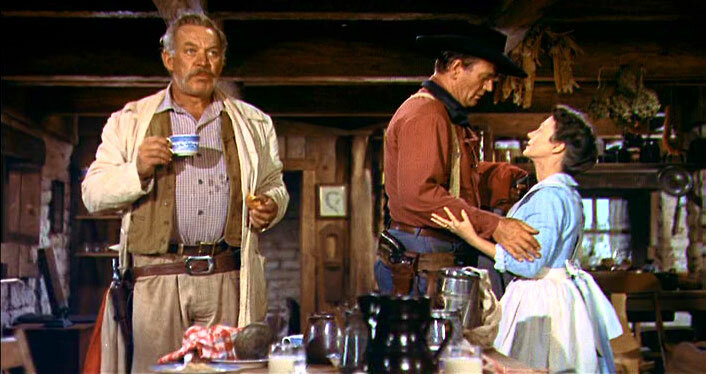 Clayton retreats with the wounded man, but Ethan, Martin, and Lucy’s boyfriend, Brad Jorgensen (Harry Carey, Jr.) continue the pursuit. Ethan mostly would like to be alone in his vengeful quest. It shows his monomaniacal personality. Martin says sarcastically, “That’s why we are here, to find the girls,” realizing that Ethan has more on his agenda than the sisters’ safety. Ethan, on a separate trail, says he found Lucy’s body, and wrapped her in his Confederate coat. This action appears symbolic of his losing his military and blood families. Brad, enraged, runs off to the Native American camp. We hear gunshots, indicating that Brad has been killed. The loss of family members in the wake of initial violence is now expanding, as a Jorgensen is now dead. 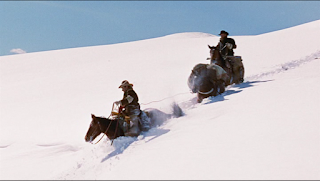 Winter sets in, and Martin and Ethan lose the trail leading to the Native Americans. They return to the Jorgensen ranch, where we find that the Jorgensen daughter, Laurie (Vera Miles) and Martin have a budding romantic relationship. This is significant because it is between a white girl and a part Cherokee, which points to the joining of diversities that can occur in The United States. Ethan and Martin discover from the Jorgensens that a trader named Futterman (Peter Mamakos) has information about Debbie. Ethan and Martin visit Futterman, who says that he bought some calico print dress material from a Nawyecka band of Native Americans led by Scar. Ethan gives half of the reward for the information, and tells Futterman he’ll get the rest when Debbie is retrieved. Ethan realizes Futterman will try to get the rest of the money, so he uses Martin as he sleeps to lure Futterman and his men to their campsite. He kills Futterman when he and two others try to ambush them. Ethan’s unfeeling use of Martin as bait, and his shooting of the other three men in their backs shows how his self-centered path of revenge has isolated him from humane actions. Their search goes on for years. It is ironic that, while pursuing Native Americans as enemies, that Martin also trades with other tribes for supplies. At one point he accidently trades for an Indian bride, named Look (Beulah Archuletta). This episode allows for some comic relief, until she finds out that they are looking for the dreaded Scar. Look abandons them. She is found later as one of the victims of a U. S. cavalry slaughter. 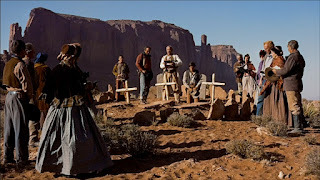 If you listen to the music played in conjunction with the cavalry, you will find that it is the same tune that is used during the cavalry massacre in the movie Little Big Man. 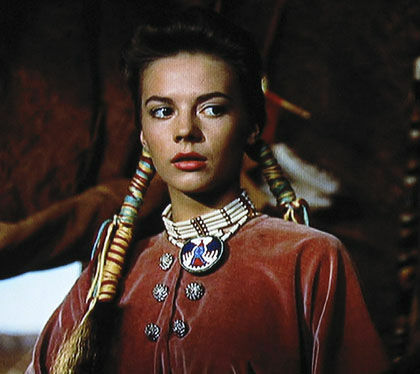 The soldiers have a few white girls that they liberated from the Comanche. The girls appear traumatized form their experiences. Ethan is horrified, believing that he may no longer see Debbie as a member of his family, but instead she might have become an alien Native American. These scenes, added to the previous ones showing violence, show how the story reveals that atrocities are perpetrated by all human beings, not just members of one race. Ethan and Martin have traveled from Texas to Colorado, and after five years, are in New Mexico. They find Mose in a Mexican saloon. He is with a merchant who deals with Scar. They meet the chief, and it is interesting that he and Ethan are annoyed that they speak each other’s language. Instead of bringing them together because they can communicate, their anger and prejudice keeps them apart. We now learn that Scar’s two boys were killed by white men. One might argue that “Scar” is an appropriate name for the Comanche warrior, since he carries the remnants of the psychological wounds he experienced due to the loss of his family members. In this way, he is similar to Ethan. Scar now takes the scalps of whites in revenge. The audience can now see that both races have violated each other’s families, which has resulted in more violence as both Ethan and Scar have embarked on their desire for revenge, each death escalating the bigotry that drives them. Ethan and Martin see Debbie, who is now dressed as a Comanche. Probably based on the native’s rules of hospitality, they are allowed to leave. But, later, Debbie rides out to tell Martin that even though she remembers how they were like brother and sister, the Comanche are her family now. Ethan rides up and is ready to kill Debbie, feeling that she is no longer a family member, and the pain of her becoming part of a Native American tribe that killed his family makes it impossible for him to tolerate her existence at this point. Scar’s men arrive, and there is a shootout. Ethan is wounded, but they are able to find safety. Ethan, now feeling that he has no family left, gives his last will and testament to Martin, to whom he has left all his belongings, including the Edwards farm. This is an ironic act since Ethan considers Martin, a part-Cherokee, supposedly related to his enemy, as the only person left that can be considered a family member. Ethan and Martin return to the Jorgensen’s farm. A young cavalry officer arrives with Mose who escaped Scar’s camp and now can tell them where to attack the Comanche. We have another ironic twist here, since it is Ethan’s former enemy, a Union officer, who helps deliver the news to aid Ethan in his quest. This is just another sign provided in the film that there are reasons for people to come together, but old prejudices and anger keep people from becoming part of a larger familial community. 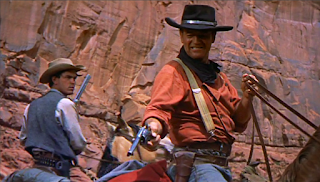 The Rangers, with Clayton in charge, ride out again to confront Scar. Martin sneaks into the Comanche camp, and in the process of rescuing Debbie, is discovered by Scar. Martin outdraws him and kills the chief. The Rangers charge in, killing and scattering the remaining tribe members. Instead of harming Debbie, Ethan, as if burying his revenge with the death of Scar, picks up his niece and says, “Let’s go home, Debbie.” The last camera shot of the movie echoes the first in the film. We look out through the doorway of the Edwards house at the beauty of the American West. We are again in the family home. At one point in the film, Mrs. Jorgensen, an immigrant, like all of our families before us who have become Americans, says that we may currently feel like we are living precariously “out on a limb.” But, she says, “some day this country’s gonna be a fine, good place to live. Maybe it needs our bones in the ground before that time can come.” Perhaps we are all searchers, looking for that hopeful day when we can all live together as family. Next week’s film is Rear Window.